The value of solar power is still unlimited. All around the world scientists are figuring out how to extract maximum power from the natural sun. Why not educate kids on Solar power with this practical car toy. It's amazing, right? Imagine a toy solar car running around your house or classroom area which will not only entertain the kids but will also educate understanding the importance of solar power system. 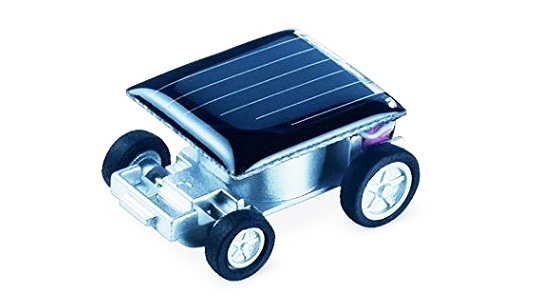 This solar powered toy does not require batteries and is about the size of a quarter and its claimed to be the smallest solar powered car in the world. The solar panel covers the entire roof, and enough to makes this baby fly instantly. You can get this car up and be running by simply placing it under bright room light or a sunlight. Available at just about 6 dollars, this toy is one of the cheapest car toy gift available online.